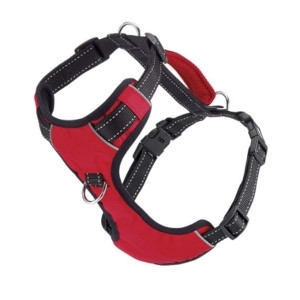 Baydog Chesapeake Harness | Castleton Pet Supply, Inc.
TRAFFIC HANDLE: Padded handle on top of the harness for ultimate control of your dog when you need it. Great for crowds or lifting them onto your boat! SENIOR DOGS: Great for helping out senior or arthritic dogs that need a little boost getting up stairs, into the car etc. EASY ON – EASY OFF: Simply put the front ring over their head and secure the clips in the back! EASY ADJUSTMENT: Four different adjustment points to ensure a snug yet comfortable fit. REFLECTIVE STITCHING: The straps all feature reflective safety stitching making your dog more visible at night. SEVEN COLORS / SIZES: Comes in 7 colors (red, green, black, blue, purple, pink, & camouflage). Matches the Hudson Bay Leash and the Frisco Treat Pouch. Available in XS, S, M, L, XL.